This light pink Camellia is reminiscent of an apple blossom. Will and Meta Jensen brought this cultivar with them as a seedling from Holland and the specific epithet is a combination of their first names. This white Camellia has impressively large single blossoms. ‘Amabilis’ is a French cultivar originating in Nantes in the 1820s. Donald G. Graham, the longtime supporter of the Washington Park Arboretum, donated this plant to the collection in 1940. ‘Shunshoko’ is a Japanese cultivar first advertised in nursery catalogs in the 1930s. The light pink and white flowers are semi-double. The Arboretum’s Camellia Collection contains almost 400 individual plants, including over 150 Camellia japonica cultivars. This cultivar boasts bright pink double blooms. Our three specimens date back to the 1940s. These and all the featured camellias can be found in the Camellia Collection along Arboretum Drive at the south end of the park. 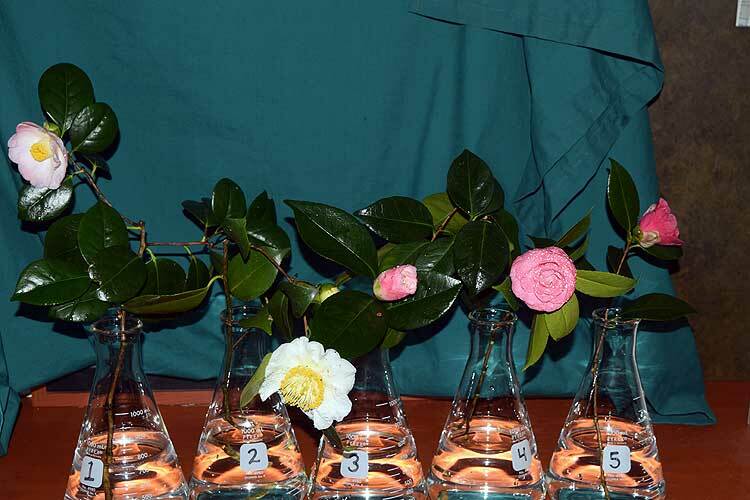 Camellia japonica is native to Japan and China where cultivars have been bred and selected for hundreds of years. There are now thousands of cultivars worldwide. Accession 2088-38-A, located on the west side of Arboretum Drive across from parking lot 5, is an unknown cultivar donated by Mrs. Palmer, a founding member of the Arboretum Foundation in 1938. The semi-double blooms are a dark fuchsia color.